At Intelligentia, we firmly believe in business led by ethics, according to the Italian Constitution principle (art.41) which states that economic initiatives cannot be in contrast with social utility and cannot damage safety, freedom and human dignity. The ethical values we follow are professionalism, competence, fairness, no-discrimination, respect of diversity, legality, openness, propriety, honesty, confidentiality, diligence, loyalty, and respect. They inspire our business, both in internal and external affairs. The Ethics Code illustrates the set of these principles. It outlines Intelligentia’s attitude internally with employees, and externally with institutions, providers, customers, commercial partners, political parties, trade unions, and press, in other terms with all stakeholders involved in accomplishing the Intelligentia’s Mission. The Code is inspired by reciprocity. Therefore, we hope that each stakeholder will adopt similar principles of Ethics in establishing a partnership with Intelligentia. 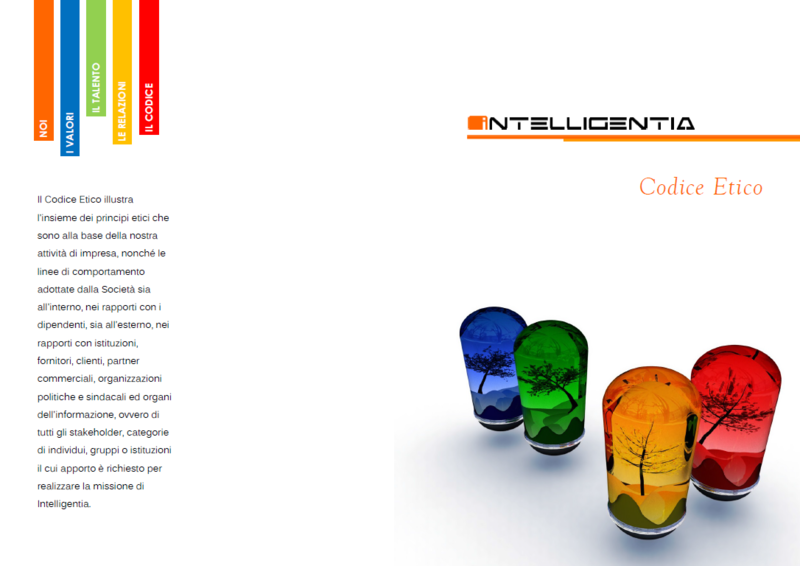 The Code is valid in Italy and abroad, even considering cultural, social and economic diversities of Countries where Intelligentia might operate or be represented. Attached below our Ethic Code approved in 2011. You can download and distribute it as needed. For any inquiry or remark, please do not hesitate to contact us. We will be glad to provide the information you are looking for.